The Pro-Ject Phono Box E is an introductory MM-only phono stage from the elemental range in a choice of black or white casing. 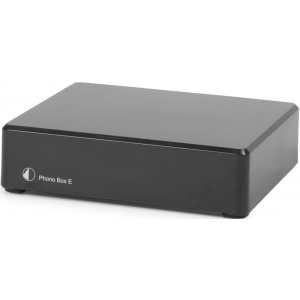 Pro-Ject Phono Box E phono stage offers excellent value for money and is an ideal choice for amplifiers or hi-fi systems that do not include a dedicated turntable input. Despite its entry-level price tag, the Pro-Ject Phono Box E delivers an audiophile music experience and accepts MM cartridges providing amplification and RIAA equalisation. The unit efficiently reduces noise and distortion thanks to the advanced circuitry and SMD construction. External interference is prevented via the outboard DC power supply and the built-in internal shielding. Owing to the small casing, the Pro-Ject Phono Box E can be easily placed near the turntable for a clutter free set-up. The level of detail goes down to the input and output sockets which are gold-plated to preserve quality and the Phono Box E can be connected easily to a line-input of your amplifier. Like the rest of the Pro-Ject Elemental range, the Pro-Ject Phono Box E is available black or white casing.